Kraft Recalls 240,000 Cases Of Macaroni And Cheese Due To Several Metal Shavings Found. 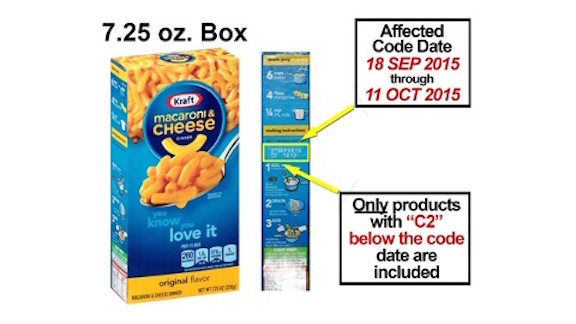 Kraft Foods is recalling 242,000 cases of original flavor Kraft Macaroni and Cheese because some of the boxes contain small pieces of metal. They were sold throughout the United States, Puerto Rico, and in some countries in the Caribbean and South America. The recall covers 7.25 ounce boxes that were sold individually and in packs of three, four and five. Kraft Foods Group Inc. says it is aware of eight incidents of consumers finding metal in the boxes, it hasn’t been informed of any injuries. It says consumers should not eat the macaroni and should return it to the store where it was purchased for a full refund.